How many of you are sick of hearing the word organize on here? Haha! I know I am after January’s focus on home organization, but wow, did I accomplish a lot during that month! 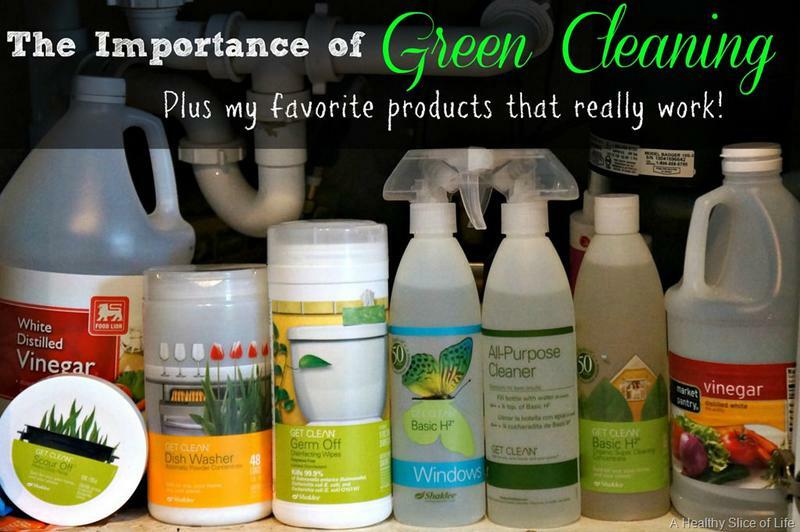 However, since I decided to break down my goals/resolutions in 2014 to monthly focuses, it’s time to move on to another topic that has become near and dear to my heart: GREEN CLEANING in the home. 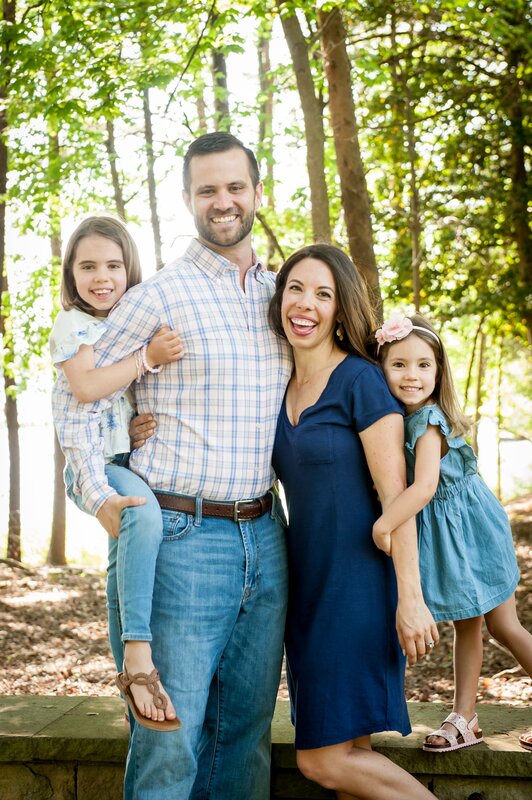 Having a two year old and being pregnant, I am pretty aware of what I put in my family’s stomachs, but I never looked too closely at what I was putting on the surfaces of my home when I cleaned it. It was always something I was “meaning to take a closer look at” but somehow never found the time. 81,000 chemicals have been registered with the EPA in the last 30 years, but fewer than 20% of them have been tested for toxicity. So who even knows the effects of some of the chemicals I possibly used everyday. In 2005 there were 218,316 reported poison exposures from household cleaning products alone. Yes, I’ve always known I had ‘poison’ under my sink, but seeing Hailey remove outlet plugs and baby locks with ease made me reconsider the location of the products. Then I realized, she doesn’t have to break into the cabinet because I’m spraying them all over the house anyway- YIKES. According to the EPA, air pollutants inside the home are often 2-5 times higher than outside. Well, guess where we spend a lot of our time?? I know cumulative exposure to chemicals can be dangerous, attributing to breathing problems and more. Did you know that 1 in 13 school age children have asthma? In fact, it increased 160% between 1980 and 1994. Another YIKES. Sure I grabbed a Method product here or there, but I needed to find a product line that I knew worked before committing. So, again, I started researching. I googled, I asked you guys on facebook, I looked into studies and pinned make-your-own products, like this one. I loved the idea of these (above how-to can be found here), but I questioned two things: did they work? And if they did, would I really take the time to buy the components and assemble all these fancy concoctions? I wanted something EFFECTIVE, GREEN and AFFORDABLE. Well, I finally found my solution. 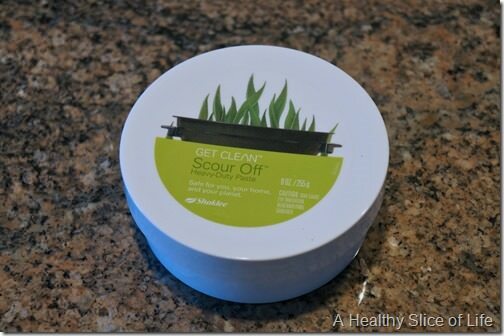 I came across SHAKLEE Cleaning Products through word of mouth from local friends and your suggestions on facebook. I waited to try them myself before mentioning them on here, but now that I’ve tested them and fallen in love, I’m ready to spread the good word! Shaklee cleaning products use all sustainably sourced ingredients from nature, are non-toxic, hypoallergenic, produce no harmful fumes, not tested on animals, affordable and effective. It’s what they use in the White House to clean green! And perhaps the Gold Standard of them all – the Basic H was named Real Simple’s Longest Lasting Concentrate! 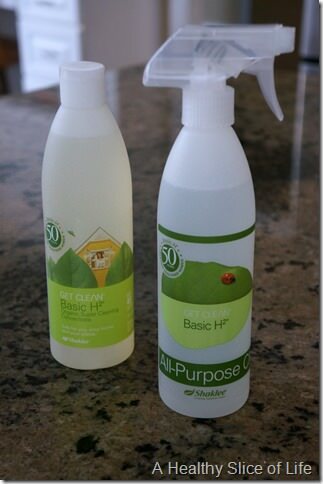 Shaklee’s Basic H is a concentrated cleaner that you use to create your different cleaners. It’s so easy and it lasts forever thanks to being ultra concentrated. I wasted no time putting it to the test. 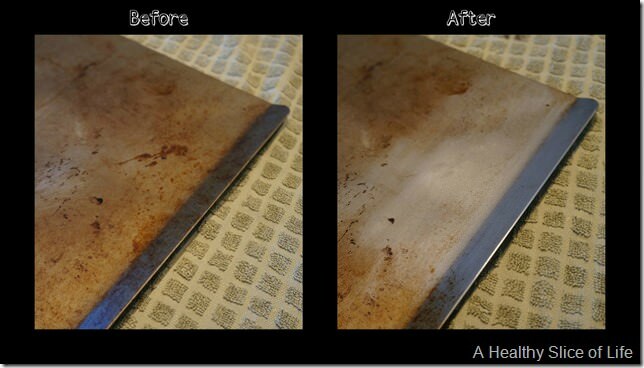 I used it on all my washable surfaces, including stainless steel. Smudge marks gone and no streaks! The window cleaner worked quickly and effortlessly on glass surfaces. And again, no streaks! Even when wiping away dog licks and peanut-butter-laden toddler fingerprints. Holy moly, you guys. LOOK. I didn’t think my baking sheet would look like that again. Embarrassing. After learning about the products and seeing how well they work first hand, I Shaklee-ized my cleaning supplies. I love that the products are affordable (they last foreverrr) and delivered right to my door. PS- did I mention they also have dryer sheets? Don’t even get me started on all the crazy chemical crap in regular dryer sheets! But man, did I miss using them before I found these veggie-based, biodegradable sheets. Whew, it’s a wordy post, but I was so excited to finally tackle one of my big to-do’s and have the house “green” for Hailey, my pregnant self and baby girl who will be here in only 3 months (ahhh! Will it really be that soon?!). Have you found affordable, green products that work that you love? I have really made an effort in the past couple months to get all the toxic chemicals out of my house including health and beauty products. I make my own products a lot and buy the occasional Method product, but I’m going to check out Shaklee! Those look great. I really like Norwex products! With a lot of their cleaning clothes, you just need water. I have streak free mirrors, faucets, etc. I’m a green cleaner and have been for several years. I love vinegar/water/lemon essential oil for my all purpose cleaner, baking soda/vinegar/tea tree oil for my toilet cleaner, and homemade laundry detergent. I also use wool dryer balls instead of dryer sheets. My sister in law just gave me two “yarn balls” (for lack of a better description) to throw in the dryer in place of dryer sheets. My towels come out so soft and fluffy! I’ve also been “thinking about” greener cleaners for awhile but haven’t done much about it, so thanks for the motivation! LOVE this! i have been trying to be much more conscious of how i clean as well. i cleaned my shower the other day (with kaboom) and nearly asphyxiated myself from the smell. it was terrible! 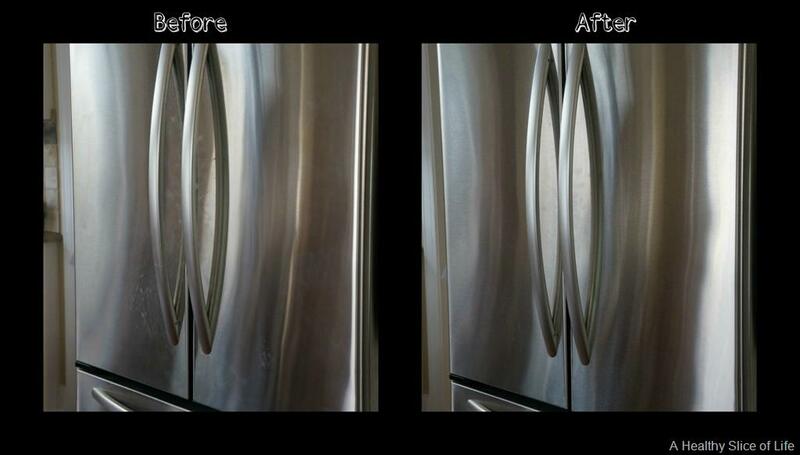 i much prefer some good ol lemon and baking soda to get rid of grime! awesome post lady. Hi Brittany! Curious what you intend to use for bathrooms. 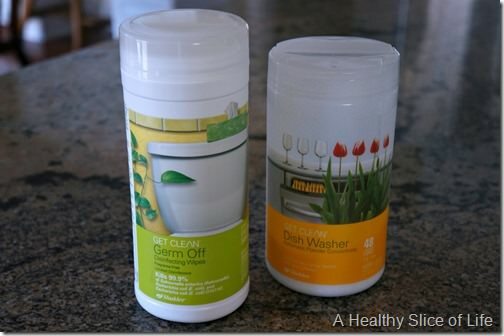 To get rid of build-up of soap residue in showers, on tiles, bathtubs, sinks, etc. Use a wet scouring pad with Scour Off and plenty of warm water. To get rid of film on mirrors and windows. Mix two drops of Basic H in 16 oz. water in a spray bottle. If you have been using other glass cleaners, you may get streaks until the oil residue they leave is cleaned off with our recommend solution. Be sure you use only drops when mixing. This works great for dusting, also. Spray on your dust rag and dust even your best wood furniture. To Disinfect, use the Germ-Off wipes. 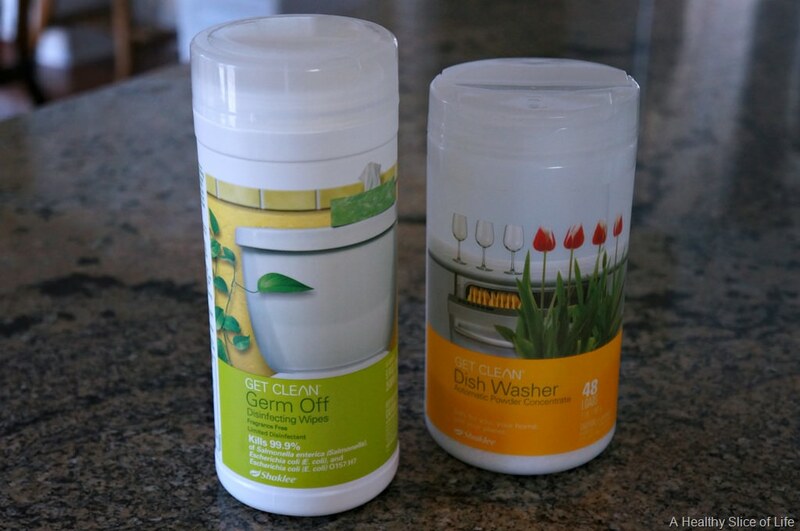 Use them to wipe the outside of garbage pails, diaper pails, bathroom vanity, kitchen sinks, toilet, etc. . It’s a great deodorizer as well as a disinfectant. To minimize clean up in the sink area. Once soap residue is removed, use Shaklee’s soap-free cleanser from now on to not only get your hands clean, but to leave no film behind. It’s effective yet very gentle to your skin. To eliminate any cleaning in shower–on walls or doors–from spots. 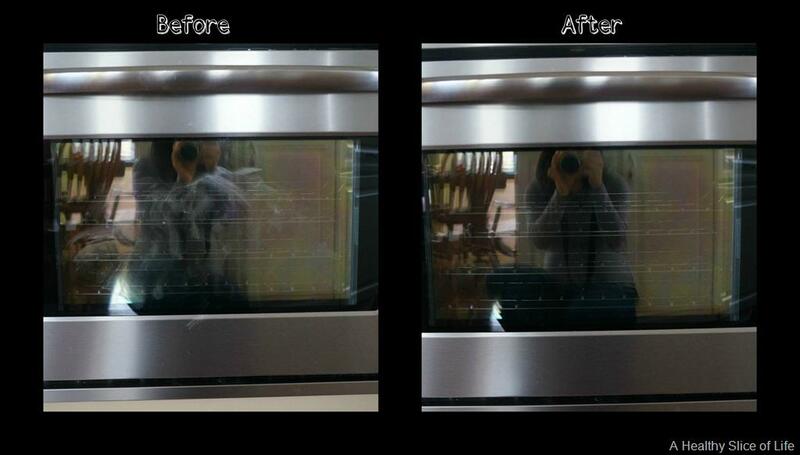 After soap residue is removed, use only Shaklee products because they don’t leave film or spots. These products are very kind to sensitive skin, including baby’s skin. 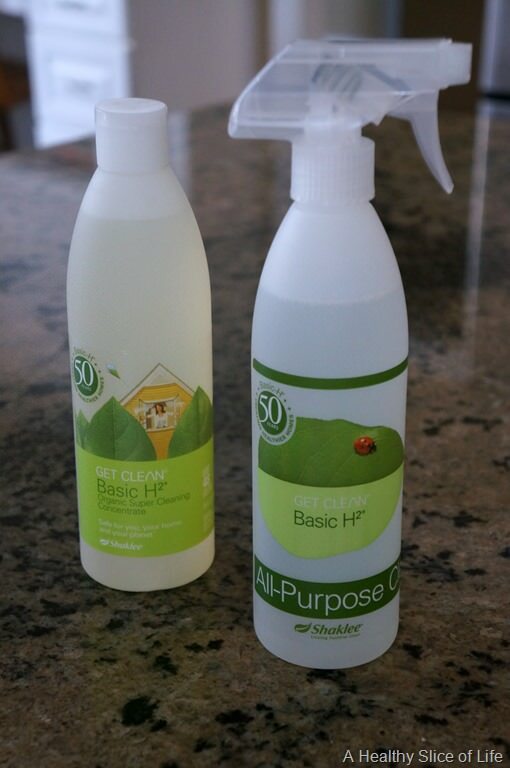 Shaklee’s cleaning products have passed every state’s tests for biodegradability and non-pollution. Many competitors’ cleaners take 10 years to decompose, Shaklee’s return to nature in 30 days and they’re also Kosher Certified for purity and ingredient labeling. Oh, and I forgot to mention, for toilets and what not, you could use Basic-G which is their germicide used in the wipes! Yes love shaklee cleaners!!! Also I think I’ve heard they’re even cheaper than using vinegar and baking soda? I love that they don’t smell bad too!! The scour off is made from cherry pits and smells so good! Oh my gosh, yes, it does smell so good! What about cook tops and inside the oven? My mom has searched for a good cleaning product for those. 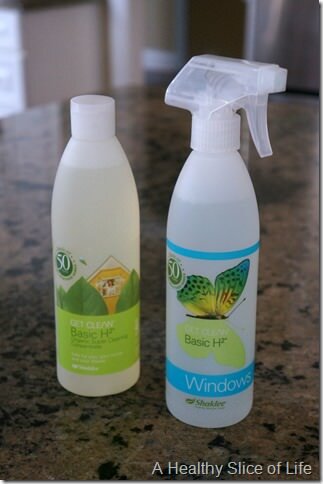 She has found a product that works well but every time she needs to clean them the doors and windows are opened. Oh my gosh, have her try the Scour Off! It’s made of cherry pits and smells good, but it seriously works. 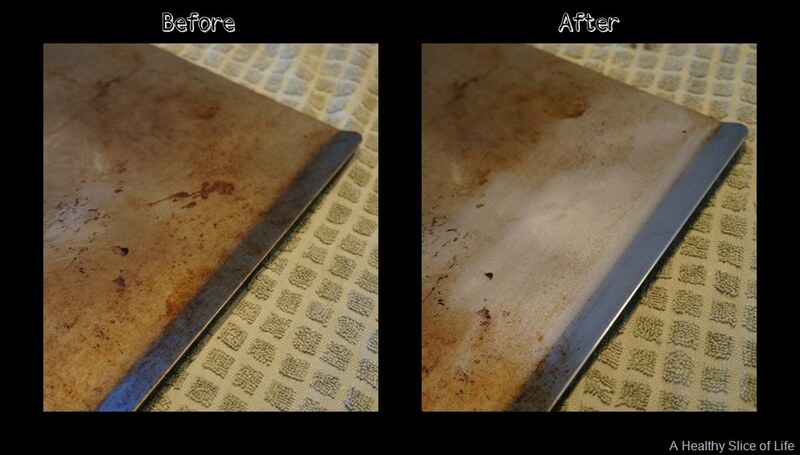 The pan I photographed above was “CLEAN” (haha, again, embarrassing) before I scrubbed it with the Scour Off. I was just seeing if I could get that one dark mark off (look at the left picture) so I gave it a try, then was shocked with how well it scrubbed off all the built up use. If she tries it, report back to me how it works. I’d love to hear if she is as surprised as I was! Is this a sponsored post, affiliate link, or anything like that? Thanks! I love this post! 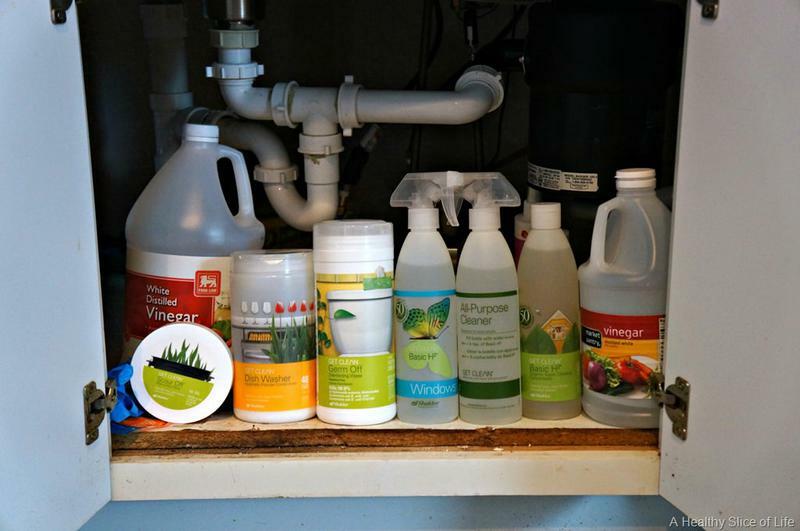 I want to get into green cleaning, so this post helped me learn a lot, and was a huge encouragement to me! I’ve been using green products for years now. Method is my usual choice, but to be honest, I don’t think things get super clean with it (beside the Method version of Windex – which is fantastic). So I’m definitely in the market for some new stuff. My nemisis is my shower. It has caulking by the tub that gets so gross and I just cannot get the mold to go away without using bleach. I’ll definitely look in Shaklee and see if they have something that may get rid of it. I just saw that they offer fragrance free products, which is great since I have a perfume allergy. If you do decide to check out Shaklee, I’d get the their Basic-G (Germicide) and let it sit on the mold for a while (10 minutes-ish) before wiping clean. I would think it could help! Bathrooms get so grimy so fast don’t they? They’re my least favorite of anything to clean! And the fragrance thing is funny because I actually love that they don’t have a fragrance, but some people don’t like that. So if you have a a favorite scent, you can always add a drop or two of essential oil to the spray bottle and make it smell anyway you like. PS- just saw your latest post is on running love/hate. Clicking over now! I’m not sure why your posts aren’t pulling up in my bloglovin anymore? I’m going to check on it! Interesting! thanks for sharing these. I will have to remember. 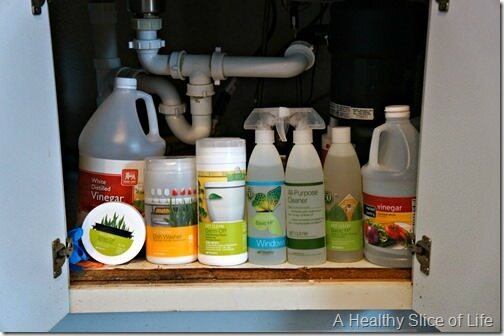 At our house, I use a vinegar solution (3 parts vinegar to 1 part water) to clean all surfaces. I started doing that during my pregnancy with Parker. You just can’t go wrong with it’s potency and ease. It’s also good for wood cutting boards, like we have, and for eliminating odors in rooms. Kath wrote about Shaklee a few years ago and I bought some then. It lasts a really long time since you use so little and mix with water. I like that it has no smell. I have to admit, I’m no green cleaner. I’ve hated every green cleaning product I’ve tried, save for some white vinegar and water on certain surfaces. Do you know if there’s a green oxiclean/ stain remover? Sometimes we get explosions of the diaper and with the new baby I wanted something to be able to get the spit up from formula and diaper explosions out. I have been using Method Cleaner but this is a great resource. I will have to check them out. Do you know if it’s available in stores? Yes, Shaklee has a stain remover called Nature Bright that is non-toxic, and it is way better than OxyClean (which I used to be devoted to)! I’ve used Nature Bright to get out blood, blackberry juice, and years-old black grime. Thank you so much for this review. I, too, I’m concerned about the chemicals that I use to clean the house. Over the last couple of years I changed over to more natural products that I would find at whole foods or use seventh generation brand or method. I have never heard of this line, but now I’m really excited to try it out! This is very intriguing to me! I’m currently in the spot that you were in before you discovered this brand. I’ve been thinking about it, and it’s been something I “keep meaning to research”. I have a few random green cleaners, but none that I’m crazy about. Obviously I need to check out this Shaklee stuff! Thanks so much for sharing your experience! Love this post! 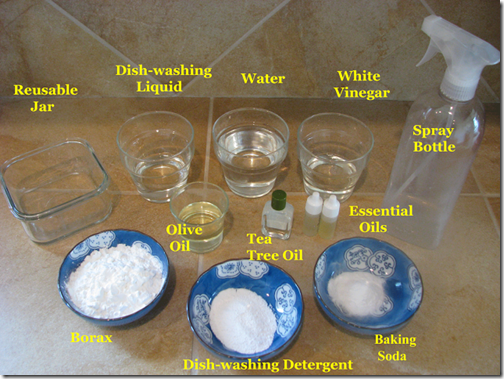 I use mostly homemade cleaners at our house and the occasionally premade green product that I buy. 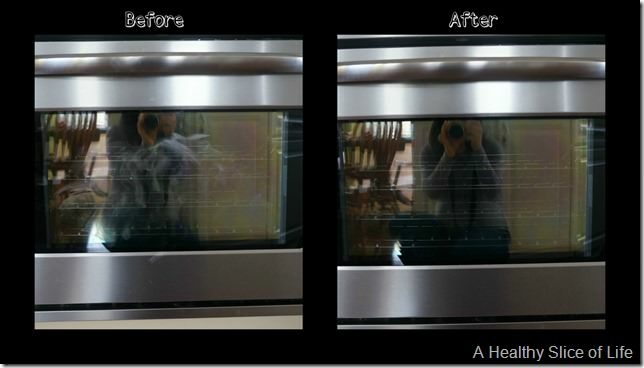 I love using vinegar and baking soda to clean. Vinegar only smells when its wet so the smell doesn’t last too long! I started making our own cleaners when I was pregnant with Cameryn and now with the second on the way I’m still just as passionate as keeping the chemicals out of our house! Thank you for sharing this! I’ve been looking for green cleaners since forever! Where can I check the list of ingredients? Emailing you with the info now! I love the Scour Off, but other than that I didn’t think the Shaklee got my tub and things like that clean. I use Melalueca, and I like it a lot better for the tub cleaner. However, this was about 4 years ago when I tried Shaklee, so I may want to try it again! If you do decide to try it again, maybe consider using the Basic-G (http://brittanydixon.myshaklee.com/us/en/products.php?sku=00525) for the tub and letting it sit for a few minutes before wiping it off. It seems to work really well on tubs and showers! PS- clicking over now to see your new mom eats and get some ideas for myself to use in 3 months- AH! Give Baby Delights a snuggle for me! Wow, these products look awesome!! And to answer your question, YES, green cleaning is VERY important over here! 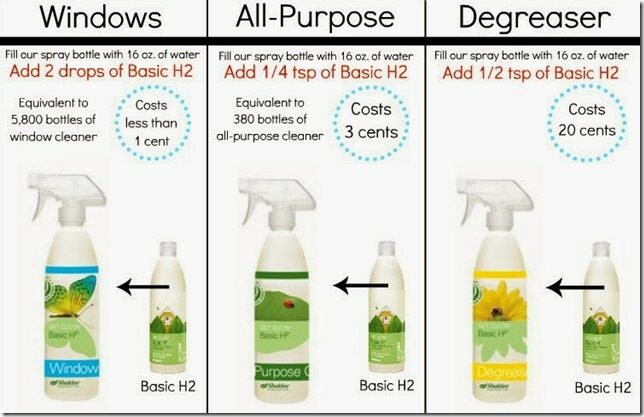 I phased out all major brands a long time ago, and switched to “greener” brands, but even now, I’ve gone to making all my own cleaning products. I actually have a post drafted with all the DIY cleaning products I use, it’s just taking pictures of my products that is holding me back from posting it! 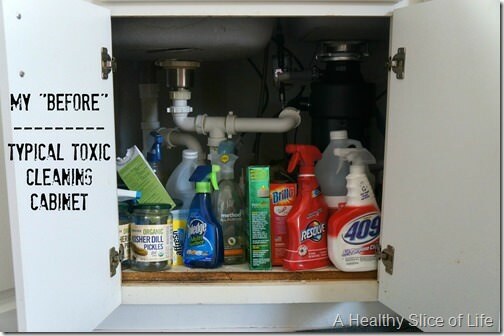 I think it’s really important to eliminate all those toxic products (Windex, Mr. Clean, etc – I’m talking to you!! ), especially since baby hands are everywhere!! I’m totally checking out this brand though, so thank you! 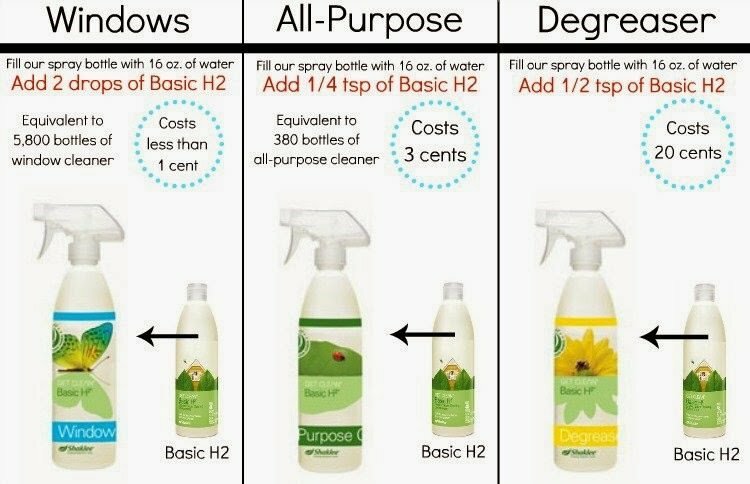 There’s also one I’m interested in that I saw on Shark Tank (can’t remember the brand), but it’s such a clean ingredient list, that the creator actually sprayed one of the cleaning products in his mouth to show how safe it is! Isn’t Shark Tank entertaining? Love that show! I too have been trying to change over to all natural cleaning products. I can’t help but think of how horrible those chemicals are for my daughter to be around if I’m cleaning while she’s awake. I will have to look at Shaklee — I’ve heard great things but never tried it. Thanks for the tips, Brittany!! I’m new to your site and love your toddler meals! My lil guy is 15 months and is rebelling against veggies. My 13 year old has always loved them so t,his is new to me. 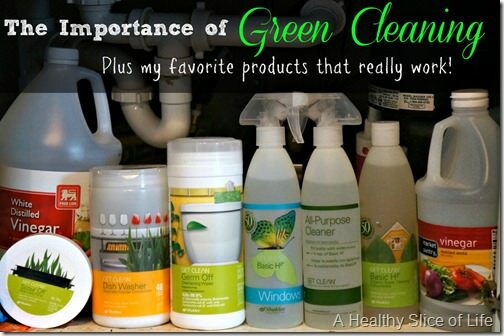 A few years ago I switched to green cleaners due to eye allergies from regular cleaners. 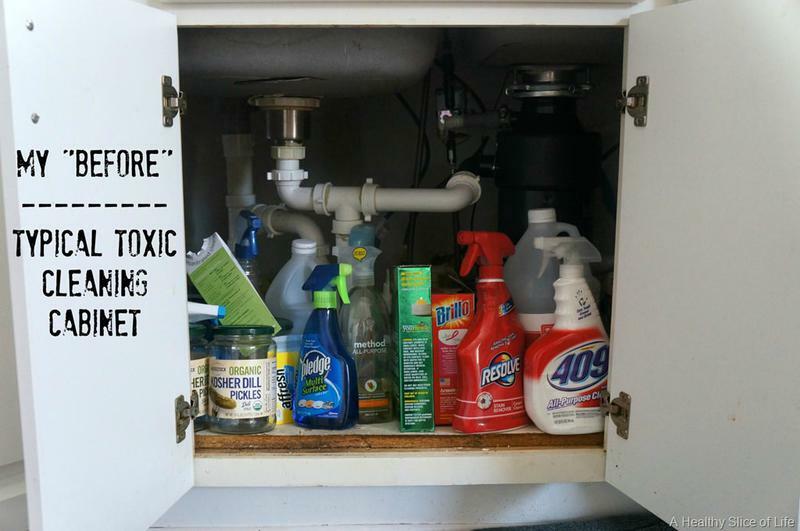 I use this site as a guide…it gives major cleaners scores to determine toxicity levels. The only thing lacking is info/reviews on how well each product works. I select my products from the site then go to Amazon to read reviews. Very eye opening. Also they have a cosmetics site which list baby products as well. An all-natural window cleaner can be made by mixing one part vinegar with two parts water. The first time you clean the windows with this method, add about a teaspoon of detergent. This is necessary because you will need to dissolve the waxy buildup many chemical cleaners contain. Frognal Carpet Cleaners Ltd. Thanks for passing along! We’ve loved Basic H for years now but I look forward to reading this article a bit closer when I have a few extra minutes.